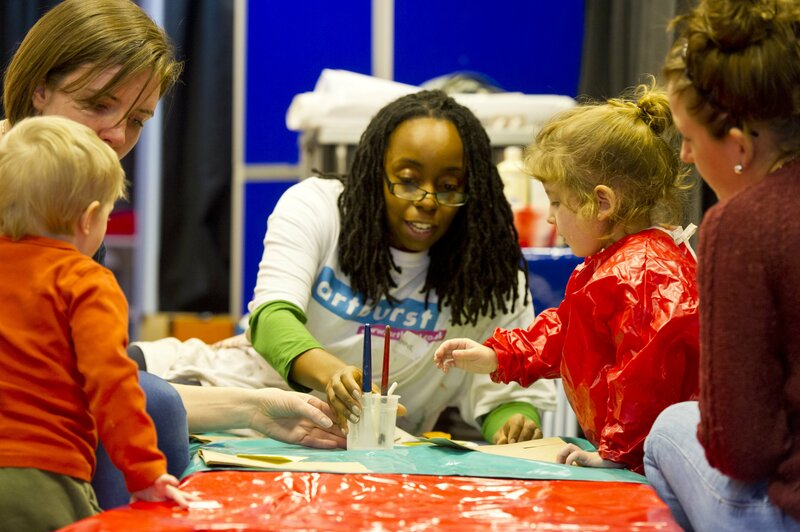 Artburst Minis early years workshops are a range of engaging, educational workshops for under 5s and their parents and carers. Sessions include singing, dancing, interactive storytelling, parachute games and art, based on popular children’s books. Shorter workshops are available in the form of Make & Paint; Storytelling and art or Ready Steady off WE GO!! Storytelling, parachute play, singing, dancing and signing. Catch us at one of our regular workshops by visiting our what’s on page. As well as being great fun, Artburst Minis help to develop mobility and co-ordination, and speech and language skills by introducing new vocabulary through songs and actions. Designed especially for early years education. Animals of Africa, Beside the Seaside, Down on the Farm, Dragons and Daydreams, Monsters and Giants, Food Glorious Food, Home Sweet Home, Hop, Skip and Jump, Into the Night, Magic Making, Moving Toys, Purely Paper, Snakes and Ladders, Traditional Tales, Circus Fun, Playing with Puppets, Transport.